Three senior Fifa officials who will vote on the 2018 and 2022 World Cup bids took bribes in the 1990s, according to the BBC's Panorama. Nicolas Leoz, Issa Hayatou and Ricardo Teixeira took the money from a sport marketing firm awarded lucrative World Cup rights, the programme alleges. The alleged bribes are included in a confidential document listing 175 payments totalling about $100m (£64m). 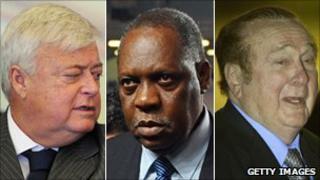 The three men did not respond to Panorama's allegations. Fifa, world football's governing body, also declined interview requests to address the allegations. In its programme broadcast on Monday evening, Panorama reported on evidence of a fourth senior Fifa executive's continued involvement in the resale of World Cup tickets to touts. The BBC has received criticism over the timing of the programme, which comes ahead of Thursday's vote by Fifa's executive committee on who will host the 2018 and 2022 World Cup finals. England is competing with Russia, Spain/Portugal and Netherlands/Belgium to host the 2018 tournament. The BBC has defended the timing of Panorama, saying the programme is in the public interest. But Andy Anson, the head of England's 2018 bid, told the BBC he was "disappointed with the timing" of the programme. "It is certainly not going to win us any votes so we just have to see what happens tonight and move on," he said. He added that members of the Fifa executive committee worked closely with each other "and of course if one of them gets hurt the others feel it. That's just life". In a statement following the Panorama broadcast, England 2018 said the programme was "an embarrassment" to the BBC. "We stand by our previous position that the BBC's Panorama did nothing more than rake over a series of historical allegations none of which are relevant to the current bidding process. It should be seen as an embarrassment to the BBC. "The 2018 team are entirely focused on winning the bid for England." The alleged bribes to the three members of Fifa's executive committee were paid by sports marketing company International Sport and Leisure (ISL) and date from 1989 to 1999, Panorama reports. The company collapsed in 2001. Fifa granted ISL exclusive rights to market World Cup tournaments to some of the world's biggest brands and ISL received millions more from negotiating television broadcast rights. A former account manager at ISL, Roland Buechel, said staff had long suspected bribes were being paid for the lucrative Fifa contracts. "It is huge money, billions, that can be earned and all the sports marketing companies they fight, they want it," Mr Buechel said. Some details of the alleged bribes emerged in 2008, when six ISL managers were accused of misusing company money. One Fifa official - Nicolas Leoz, of Paraguay, the head of South America's football confederation - was named in court papers in connection with payments totalling $130,000 (£83,000). But Panorama has obtained a confidential ISL document which lists 175 secret payments. It shows Mr Leoz was paid a further $600,000 (£384,000 using current conversions) in three instalments of $200,000. Mr Leoz did not respond to requests for comment on Panorama's allegations. The second Fifa official named by the programme, Ricardo Teixeira, is head of the Brazilian Football Confederation which is responsible for staging the 2014 World Cup. The ISL list shows a front company in Liechtenstein called Sanud received 21 payments totalling $9.5m (£6m). I can't help feeling it would be a better role for England to actually be insisting on the reform of Fifa, making Fifa transparent, making Fifa accountable instead of kowtowing to Fifa in order to get the World Cup finals. Mr Teixeira was closely linked to Sanud by an inquiry of the Brazilian senate in 2001. It found that funds from Sanud had been secretly channelled to Mr Teixeira through one of his companies. Mr Teixeira also did not respond to Panorama's request for comment on the allegations. The list obtained by Panorama also includes details of 100,000 French Francs (£12,900) paid to Issa Hayatou, the Fifa vice-president representing football in African nations. Mr Hayatou also did not respond to the allegations when contacted by Panorama. Fifa president Sepp Blatter said in a statement that the 2008 court case had largely exonerated the former ISL officials. He said: "It is important to stress that no Fifa officials were accused of any criminal offence in these proceedings." At the time when ISL are alleged to have been paying the money out, it was not a criminal offence. The recipients of most of the money paid by ISL into accounts in Liechtenstein cannot be traced. These latest allegations of wrongdoing by Fifa executive members come after two of the 24 committee members were banned last month from voting in Thursday's ballot. The bans came after the London-based Sunday Times accused Amos Adamu and Reynald Temarii of being willing to sell their World Cup votes. Critics of Fifa say a full investigation is required. "I can't help feeling it would be a better role for England to actually be insisting on the reform of Fifa, making Fifa transparent, making Fifa accountable instead of kowtowing to Fifa in order to get the World Cup finals," said David Mellor, the former chairman of the Football Task Force in Tony Blair's government. The fourth Fifa executive named in the Panorama programme is Trinidad and Tobago's Jack Warner, one of the organisation's vice-presidents. Panorama says it has seen e-mails and an invoice which show Mr Warner was involved in the procurement of $84,000 worth of 2010 World Cup tickets. The e-mail trail suggests the tickets were destined for the black market but the planned deal - including 38 tickets for the final in Johannesburg - collapsed because the touts were not prepared to pay the asking price. In 2006, Panorama revealed that Mr Warner had sold tickets on the black market for that year's World Cup tournament in Germany. Fifa subsequently ordered Mr Warner's family business, Simpaul Travel, to make a $1m donation to charity to "compensate for the profits it had made through resale of 2006 Fifa World Cup tickets". At a recent press conference, Mr Blatter was asked about the fresh allegations against Mr Warner by a Norwegian journalist who first broke the story of the e-mails. Mr Blatter replied: "Should it be knowledgeable to us, by official means, or by official channels, then naturally we would have to look at that." Fifa's media office, when asked by the Norwegian journalist what Mr Blatter meant by "official channels", reportedly replied: "We have no idea." England 2018 said the programme was "an embarrassment" to the BBC. It said in a statement: "We stand by our previous position that the BBC's Panorama did nothing more than rake over a series of historical allegations, none of which are relevant to the current bidding process. It should be seen as an embarrassment to the BBC. Panorama: Fifa's Dirty Secrets was broadcast on BBC One on Monday, 29 November and is now available in the UK on the BBC iPlayer. David Bond: What does it mean for England? The death toll from Sunday's bomb attacks rises to 321 and a state of emergency is in effect. Could a computer ever create better art than a human? Who are the victims of the Sri Lanka attacks?